It could be argued that a new space race has begun, in which private companies are competing against each other and against government organisations. But this time it is driven by a competition for customers rather than the urge to show dominance by being first to achieve a certain goal. So who are the main players and how will they change the science, technology and politics of space exploration? Put the phrase "private space exploration" into a search engine and a wealth of links emerges. Several have titles such as: "Six private companies that could launch humans into space", "The world's top 10 most innovative companies in space" or "10 major players in the private sector space race". What is immediately apparent is that practically all these companies are based in the US. There is a big difference between building and launching satellites into low Earth orbit for telecommunications and sending crew and cargo to the International Space Station (ISS) and beyond. Private companies in several nations have been engaged in the satellite market for many years. Their contributions to the development of non-governmental space exploration has helped to lay the trail for entrepreneurs with the vision and resources to develop their own pathways to space. Today, several companies in the US are looking very specifically at human spaceflight. The three that are perhaps furthest down the road are SpaceX, Blue Origin and Virgin Galactic. The main goals of all three companies is to reduce the cost of access to space – mainly through reuse of launchers and spacecraft – making space accessible to people who are not specially trained astronauts. One thing these companies have in common is the private passion of their chief executives. SpaceX was founded in 2002 by Elon Musk, a charismatic entrepreneur, engineer, inventor and investor. The ambition of SpaceX is "to revolutionise space technology, with the ultimate goal of enabling people to live on other planets". To this end, the company has specialised in the design, manufacture and launch of rockets, providing direct competition to the United Launch Alliance (between Boeing and Lockheed Martin) that had been the contract holder of choice for launch of NASA and Department of Defense rocket launches. Its success has been spectacular. 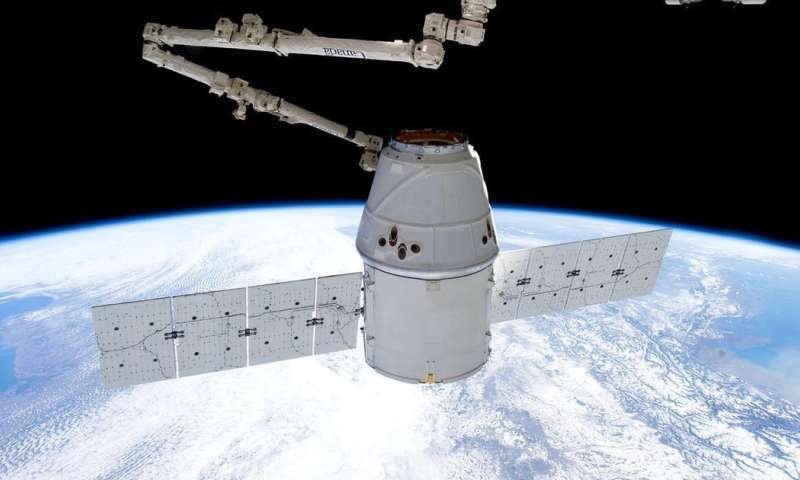 Having developed the Falcon 9 launch vehicle and Dragon spacecraft, it became the first commercial company to dock a spacecraft at the ISS in 2012. The firm now has a regular run there, carrying cargo. But so far, no astronauts. However, the Falcon Heavy is comparable to the Saturn 5 rocket that launched the Apollo astronauts, and SpaceX has designed its vehicle with a view to sending astronauts to the moon by 2018, and to Mars as early as 2023. On September 29, Musk refined his plans, announcing the BFR project (which I like to pretend stands for Big F**king Rocket). 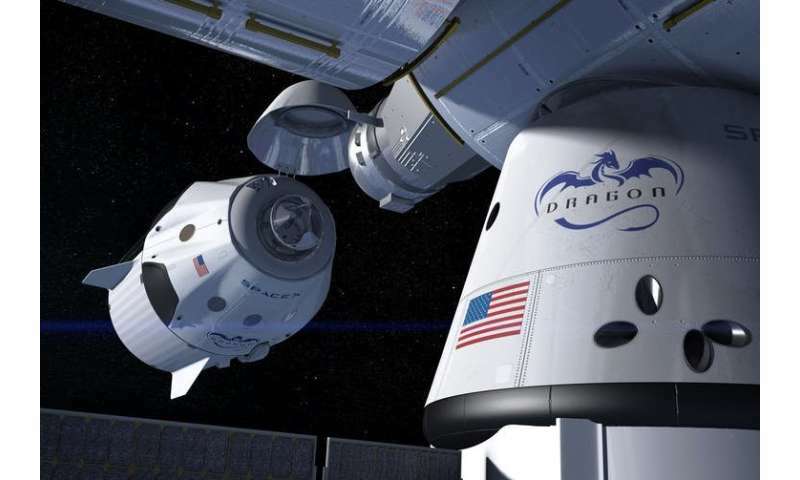 This would replace the Falcon and Dragon spacecraft – and would not only transport cargo and explorers to the moon and Mars, but could also reduce travel times between cities on Earth. Musk calculates it could take as little as 29 minutes to fly from London to New York. Whether the company succeeds in sending astronauts to the moon in 2018 remains to be seen. Either way, a lot could be going on then – 2018 is also the year when Blue Origin, founded in 2000 by Jeff Bezos, the technology and retail entrepreneur behind Amazon, aims to launch people to space. But its ambition is different from that of SpaceX. Blue Origin is focusing on achieving commercially available, sub-orbital human spaceflight – targeting the space tourism industry. The company has developed a vertical launch vehicle (New Shepard, after the first American astronaut in space, Alan Shepard) that can reach the 100km altitude used to define where "space" begins. The rocket then descends back to Earth, with the engines firing towards the end of the descent, allowing the spacecraft to land vertically. Test flights with no passengers have made successful demonstrations of the technology. The trip to space and back will take about 10 minutes. But Blue Origin has got some competition from Virgin Galactic, which describes itself as "the world's first commercial spaceline". Founded in 2004 by Richard Branson, also a technology and retail entrepreneur, it plans to carry six passengers at a time into sub-orbital space and give them about six minutes of weightlessness in the course of a two and a half hour flight. The technology differs from that of SpaceX and Blue Origin in that the launch into space is not from the ground, but from a jet airplane. This mothership flies to an altitude of about 18km (about twice as high as regular aircraft fly) and releases a smaller, rocket-powered spacecraft (SpaceShip Two) which is propelled to an altitude of about 100km. The programme has been delayed by technical difficulties – and then by the tragic loss of pilot Mike Alsbury, when SpaceShip Two exploded in mid-air during a test flight in 2014. No date is yet set for the first passengers to fly. There's also the Google Lunar XPrize competition, announced in 2007, with the tagline: "Welcome to the new space race". The aim of the prize is to launch a robotic mission to the moon, place a lander on the surface and drive 50 metres, sending back high-quality images and video. The competition is still in progress. Five privately funded teams must launch their spacecraft to the moon by the end of 2017. The changes are taking place against a backdrop of tried and tested international collaboration in space, which took off in earnest at the end of the space race. Throughout the 1980s and 1990s, the US and Russia space programmes complemented each other beautifully – though perhaps not intentionally. Following the cessation of Apollo in 1975, the US space programme focused its efforts on robotic exploration of the solar system. The Voyager probes gave us amazing images of Jupiter, Saturn, Uranus and Neptune. The Mariner and Viking missions to Mars led to Pathfinder, Spirit, Opportunity and Curiosity. Messenger orbited Mercury and Magellan orbited Venus. 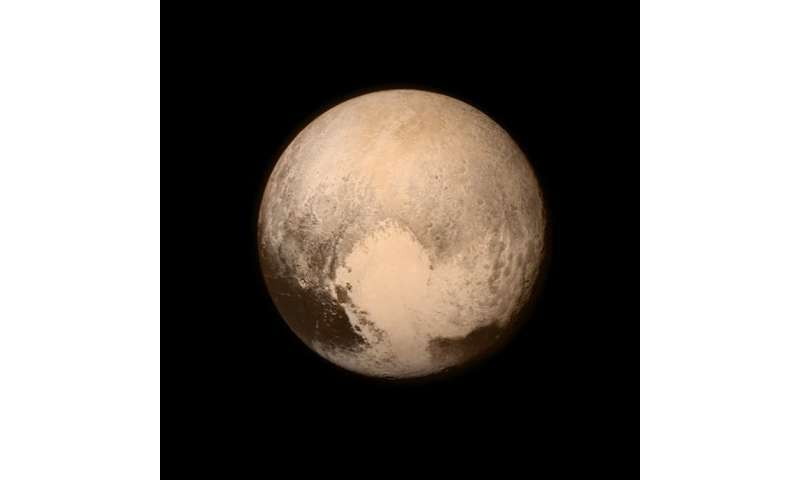 When New Horizons launched to Pluto in 2006, it was a mission to visit the last planet left unexplored in the solar system. Russia, on the other hand, pursued the goal of human spaceflight, with its incredibly successful Mir orbiting space station and its programme of flights to transfer cosmonauts and cargo backwards and forwards to Mir. Human spaceflight in the US revived with the Space Shuttle and its mission to build and occupy the International Space Station (ISS). The list of nations that contribute to the ISS continues to grow. The shuttle programme finished in 2011 and, since its successor Orion (built in collaboration with European Space Agency, ESA) is not due to come into service until at least 2023, the international community has been reliant on Russia to keep the ISS fuelled and inhabited. Today, as well as the US and Russia, there are strong, vibrant and successful space programmes in Europe, Japan, India and China. The European Space Agency was established just two months before the historic handshake of 1975, following many years of independent aeronautical engineering research by individual nations. Similarly, the Chinese, Japanese and Indian space agencies can trace their heritages back to the 1960s. A number of smaller countries including the United Arab Emirates also have ambitious plans. Of course these countries also compete against each other. There has been widespread speculation that the entry of China into the field was sufficient to introduce a fresh imperative to the US space programme. China has a well-developed space programme and is currently working towards having a space station in orbit around the Earth by about 2020. A prototype, Tiangong-2, has been in space for almost a year, and was occupied by two astronauts (or "taikonauts") for a month. China has also had three successful missions to the moon. And its next mission, Chang'e 5, due to launch towards the end of 2017, is designed to bring samples from the moon back to Earth. China also has a declared intent of landing taikonauts on the moon by 2025 – the same time frame in which the US will be testing its new Orion spacecraft in orbit around the moon. But while there's an element of competition, the success of the past few decades certainly shows that it is possible to collaborate in space even when tensions rise on the ground. Indeed, space exploration may even act as a buffer zone from international politics, which is surely something worth having. It will be interesting to see how a wider role in space exploration for private companies will affect such international collaborations, especially since so much of the effort is based in the USA. Healthy competition or dangerous game? A benefit of the entry of the private sector into space exploration has been recognition of the high-tech companies that contribute to the growth of the economy as valuable targets for investment. Indeed, a recent presentation at an international investment bank – under a heading of "Space; the next investment frontier" – declared that "investment interest has helped reduce launch costs and spur innovation across related industries, opening up a new chapter in the history of the space economy". One of the last engagements of Barack Obama's presidency was to chair the Whitehouse Frontiers Conference, where space exploration was discussed as much within the context of US industry as within the drive to explore new worlds. Contributors to the conference included NASA – but overwhelmingly the speakers were from private technology and investment companies. Perhaps it is cynical to say – but once investment starts to flow, lawyers won't be far behind. And that is another aspect of the explosion of interest in space commerce and tourism. Laws, statutes and other regulations are necessary to govern the international nature of space exploration. At the moment, the United Nations, through its Office for Outer Space Affairs, is responsible for promoting international cooperation in the peaceful uses of outer space. It also oversees operation of the Outer Space Treaty, which provides a framework for the governance of space and activities that might take place. While the obvious lack of "space police" means that it cannot be practically enforced, it has never actually been violated. The operation is designed along similar lines to the international treaties that oversee maritime activities and the exploration of Antarctica. This is the closest that there is to international legislation and, since coming into operation in 1967 with the three inaugural signatories of the United States of America, the United Kingdom and the (then) USSR, the treaty has been signed by 106 countries (including China and North Korea). It is necessary to have such controls because although the risks that surround space exploration are high, potential rewards are even higher. If we look at the way more conventional businesses operate, such as supermarkets, competition drives prices down, and there is little reason to believe that competition between space companies would follow a different model. In which case, greater risks might be taken in order to increase profitability. There is no evidence for this so far – but as the field develops and additional private companies move into space exploration – there will be a higher probability of accident or emergency. The treaty says that a state launching a probe or satellite is liable to pay compensation for damage when accidents occur. However, the costs of space exploration are astronomical and crippling to poorer countries, making them increasingly depend on commercial launchers. But if a private company launches an object that subsequently causes damage in space, the struggling economy will have to pick up the bill. The treaty may therefore need to be updated to make private companies more liable. There are also serious issues around the safety of astronauts, who have the legal right to a safe existence when in outer space. But even lawyers aren't sure whether the law does – or should – extend to private astronauts. Looking to the future, there will be a need for an expanded version of a Civil Aviation Authority, directing and controlling routes, launches and landings on Earth, and between and on planetary bodies. All the safety and security considerations of air and sea travel will pertain to space travel at a vastly enhanced level, because the costs and risks are so much higher. There will have to be firm and well-understood protocols in the event of a spacecraft crashing, or two spacecraft colliding. Not to mention piracy or the possibility of hijack. All this might sound a little gloomy, taking the dash and exhilaration from space exploration, but it will be a necessary development that opens up the era of space travel for citizens beyond those with deep pockets. The original space race resulted from the ideas and skills of visionary theoretician engineers including: Robert H Goddard, Wernher von Braun, Konstantin E. Tsiolkovsky… Is it too far a stretch to think that the second space race is propelled by a new generation of entrepreneurs, including Bezos, Branson and Musk? If this is the situation, then I would hope that the main enabling factor in the pursuit of space endeavours is not possession of wealth, but that vision, ingenuity and a wish for the betterment of human are the main driving forces. What's the big deal about private space launches?